Lately, I’ve been doing everything in my power to use up my garden vegetables. 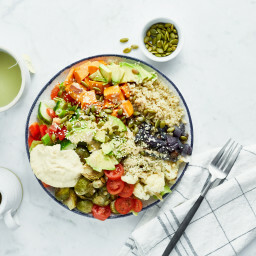 Over the past week I’ve been enjoying Roasted Tomato Basil Pesto, Long Weekend Grilled Salad, Kale Chips, cucumbers and hummus, Weekend Glow Kale Salad, and Chocolate Chip Cookies. To balance out the vegetables of course. This end of season bounty reminds me of the organic Plan B CSA that we had last summer. There is so much produce to use up! I think I might be starting to lose friends. We’ve been getting a lot of wet and humid weather lately and I realized if I leave the peppers on the plant too long the inside starts to grow mold. Never a good thing to discover when you slice one open! 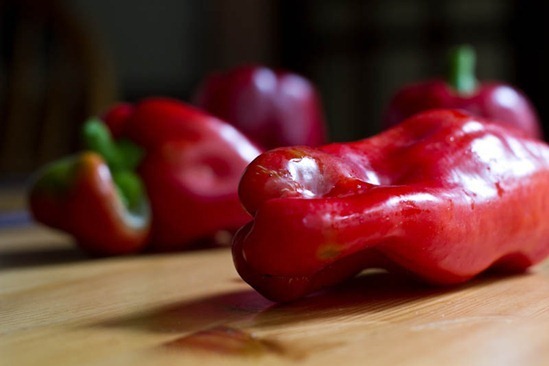 I knew that I had to use up these beautiful peppers…or bust. And because I seem to be obsessed with roasting and grilling things lately, I decided to roast my peppers. Roasting is a great way to “condense” a large amount of vegetables. Kale chips, I’m looking at you! Ever roasted peppers before? I used to be scared to try because I thought it was really difficult. You want me to PEEL the skin off? How in the world…? 1. Start by preheating the broil setting on your oven (I used heat setting 4 out of a possible range of 5) and move the rack up to the top or second highest spot. 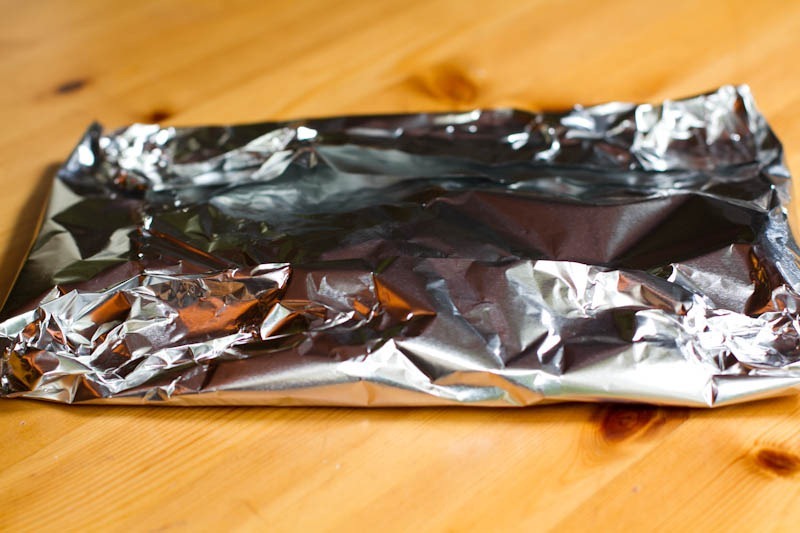 Line a large baking sheet with tinfoil. 2. 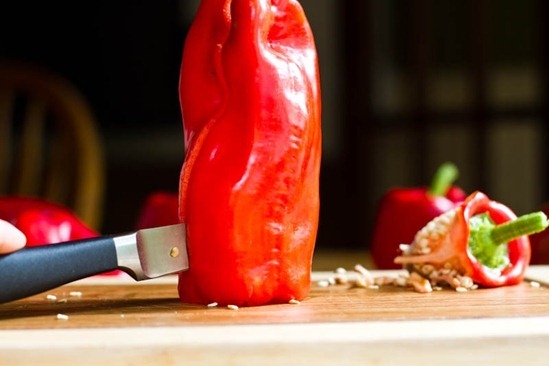 With a paring knife, carefully slice a circle around the top of the pepper. You can use any type of pepper you prefer! I used bell peppers and banana peppers, as that’s what I grew in my garden. Discard the inner flesh and seeds as best as you can. 3. With the cut side down, slice down the middle of the pepper, creating two halves. Like so. Remove rest of seeds. 4. With your hand, SQUASH each piece! Whee! I’m sorry for this picture, I really am. I’m a one woman show, clearly. 5. Place all the flattened pieces onto your baking sheet. I roasted about 6 small peppers, but if using large ones, you could probably use 3? P.S.- This baking sheet should be lined with tin foil not parchment– I changed this after I took the photo. 6. Broil for about 10-13 minutes, until blackened. My peppers were in there about 12-13 minutes at broil setting 4. 7. This is where your tin foil comes in handy! Carefully wrap up the peppers with the tin foil and let it steam for about 15-20 minutes. Meanwhile, you can prepare your hummus ingredients. 8. After 15-20 mins, gently peel off the blackened skin. This is why it’s important to really blacken your peppers; the more black the skin gets the easier it is to peel away. It really does come off easy. 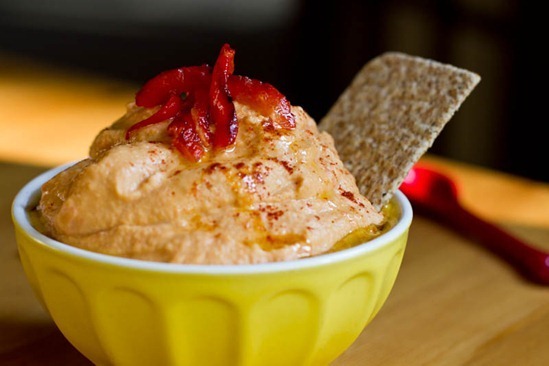 Now it’s time to make delicious, creamy roasted red pepper hummus. It’s just what you do! 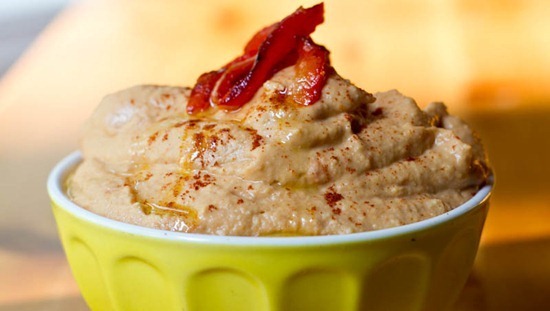 This is one of the creamiest hummus recipes that has ever come out of my processor! It has a light sweetness with a lovely roasted flavour thanks to the roasted red peppers. Open the can of chickpeas and spoon off 2 tablespoons of the brine (liquid). Reserve this for the recipe. Now, drain the rest of the can and rinse the chickpeas well. Add the garlic clove into a food processor and process until finely chopped. Add the drained chickpeas, roasted red peppers, tahini, lemon juice, and reserved chickpea brine into the food processor. Process until the hummus is silky smooth. Scrape down as necessary. Now add in salt and cayenne, to taste, and process again until combined. Scoop into a bowl and drizzle with olive oil and garnish with paprika. This hummus will last about 4-5 days in the fridge in a sealed container. 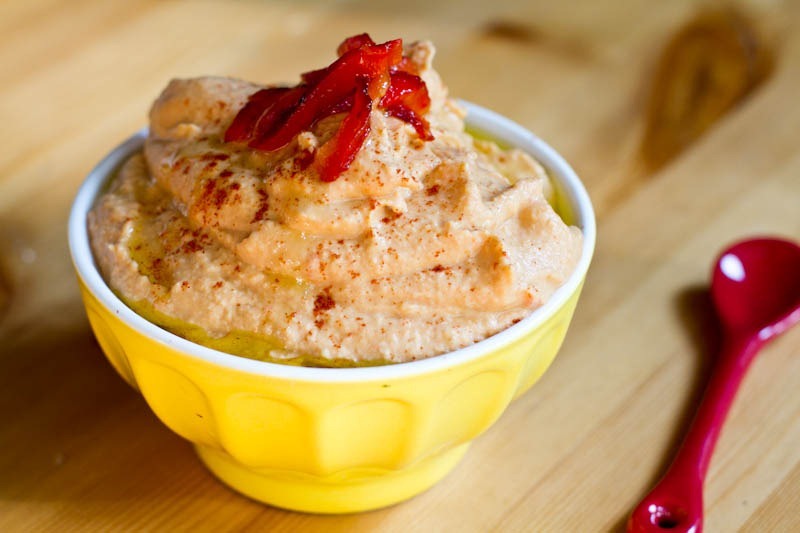 Thanks to the delicious roasted peppers, this is the creamiest and silkiest hummus to come out of my processor! I couldn’t get over how smooth it became once I put the roasted peppers in. It was as if I added a half cup of oil, only I didn’t. Yeehaw. Roasted red pepper hummus is my favorite kind! I have a thing for the Athenos brand at HEB. Thank you for a homemade recipe! I love making things myself because I know exactly what goes into them. I’m always afraid that big companies add harmful things into food to increase shelf life, so I have to be really careful with what I buy. Thanks for showing how easy the process is. 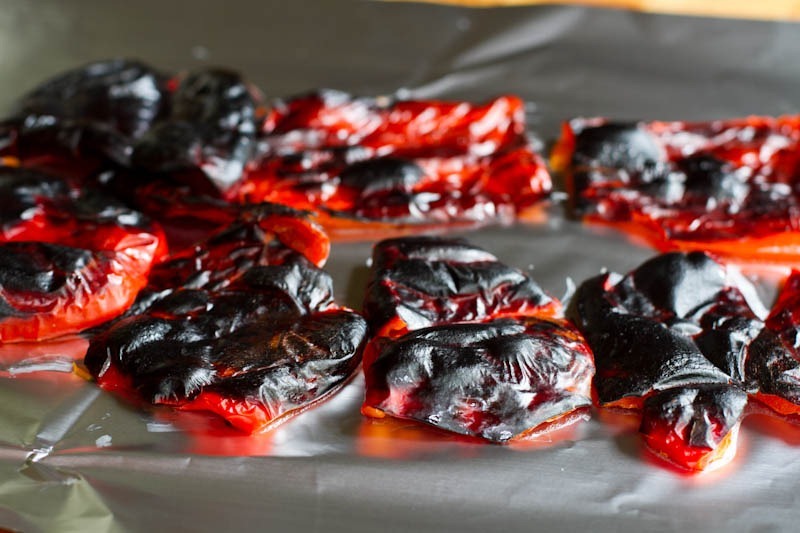 I’ve always been scared of roasting peppers thinking I’d either burn myself, the house or be stuck peeling skins for like 8 hours or something! I seriously miss good hummus. Dining hall food makes me want to vom. Come visit and bring me a batch?! Oh I am all over this like a (clever quip here)!! Grilling them works pretty well, too. 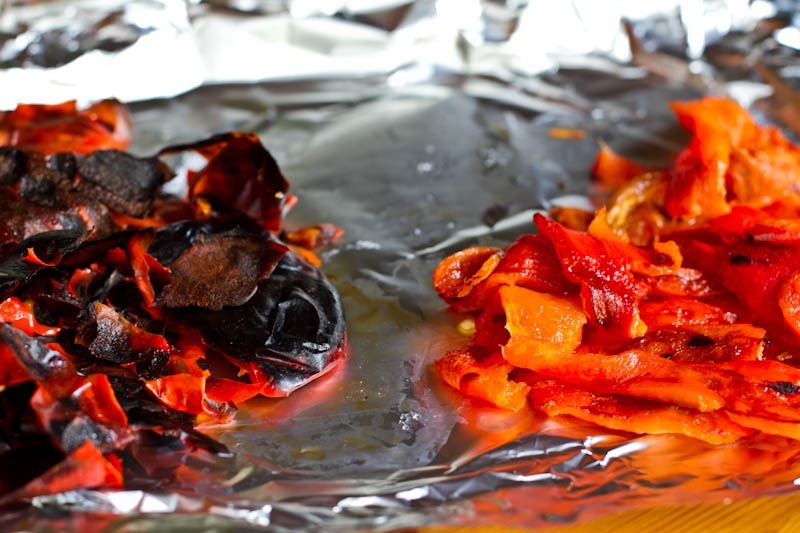 Next time you have a ton of red peppers, roast them/grill them until blackended and remove the skin. The gently saute some garlic in olive oil, add the roasted peppers, with some water, along with a small potato or sub some milk for water (for creaminess). Freshly ground coriandor is a nice spice addition along iwth S&P. Blenderize. Voila — roasted tomato soup. You can do this with squash, too. Works as a chilled soup, as well. i’d eat that for breakfast it looks fabulous! I would LOVE to be your neighbor. You would be the greatest neighbor ever. God knows the neighborhood we live in is like dry toast land. 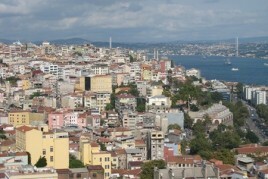 Can’t wait to move next year! Lovely hummus recipe. Have a lovely day! can’t wait to try this out! And I have red peppers in my fridge right now…ehehe guess I know what will happen to them! I LOVE red pepper hummus! It is my favorite kind. I’ve been planning to make some but haven’t felt inspired. This did the trick! Thanks as always. I have a jar of tahini that I need to use… definitely going to try this hummus recipe today =) Looks amazing! Loved your original hummus recipe, and this one looks amazing. I absolutely love roasted red pepper hummus. Been buying it for ages, but only got into making my own hummus recently. Haven’t experimented with many flavors yet, but I’ve got to try this. :) Thank you! YUM! Roasted peppers on anything is totally my jam. That hummus looks so luxurious! I’ve been giving my peeps the “greens bouquet” too! A little red and green chard, some regular kale, little dino kale, maybe some parsley sprigs… Flowers are boooring! I had absolutely no idea how roasted peppers came about – I can’t wait to make a roasted pepper avocado spread for sandwiches this week! I don’t ever use that much tahini in my hummus recipes but I’m going to have to give it a try…1/4 cup eh… I’m on it! I already added your Roasted Tomato Basil Pesto to my “to-make” list, and now I have this to add. I love roasted red peppers. I would probably eat them straight out of the oven before even getting out my food processor to make the hummus. And thank you for the foil tip! I would always use parchment! By the way, I’ll take as many kale bouquets as you’re willing to give. Your neighbors are lucky! That is so cool! I have always been intimidated to roast peppers, but With these directions, I Think I can handle it! :) thanks for sharing! Can I ask you a gardening question? I just started gardening this year. For my summer veggies I started with transplants but for the fall I’m starting from scratch with seeds. I have a little greenhouse filled with pellets that will turn into individual plants for me to transfer. (They’re sprouting already!) I have things like kale, beets, snap peas, arugula, spinach, broccoli, etc. My question is how many seeds does it take to grow one plant?? I can’t find this info anywhere. I just took a guess and planted about 5 of the teeny tiny kale seeds per pellet, about 3 of the larger snap pea seeds per pellet and about 2-3 for the beets. How the heck am I supposed to know how many seeds it takes to make one plant? I’m just totally guessing here. Hmm good question! When I planted seeds (like for my carrots) I just read the spacing requirements on the back of the package or in my gardening book (the low maintenance garden). It usually said 1) how deep to plant the seeds, and 2) how far apart they should be. I guess for pellets it would be more difficult to figure out (I planted straight into the bed), but maybe someone else can help you out here! oops I forgot to answer that part of the Q! lol. This hummus looks fantastic! I may have to pull out my food processor today. Your original hummus is one of my go-to recipes already. I made the Roasted Tomato and Basil Pesto last night and the roasted tomatoes were the best thing ever! I was wondering if it would work to use roasted tomatoes to make hummus as a substitute for the peppers? If not I’ll def be making the red pepper hummus next week! I was wondering the same thing! I think the roasted tomatoes would make the hummus more watery. You could try adding a bit at a time, or maybe Google some roasted tomato hummus recipes to see how others did it. Good luck! When I googled it I found a few, but I didn’t see any mention of doing anything different to avoid the excess water from the tomatoes. I may try doing it and just dicing the tomatoes after roasting them to squeeze out the water and patting them dry with a paper towel. Totally counts as lunch. Holy yum! LOVE the roasted red peppers. They look so beautiful with the char on them – and you can’t beat them as a flavoring for hummus! heck yes that counts as lunch! I posted s very similar recipe a while back and it was some of the tastiest hummus I’ve ever had. Sweet and smokey from the peppers. And you would not lose me as a friend if you brought me kale! I’ve been eating it by the pound this past week, sauteed with garlic and onions, its SO delicious I can’t seem to get enough of it. I love red peppers, I’m just not a fan of them roasted, no idea why. Though I do love red pepper hummus! Yum! I just bought a food processor and I need to christen it with some hummus! I love roasted red peppers, looks like this could be a winner. 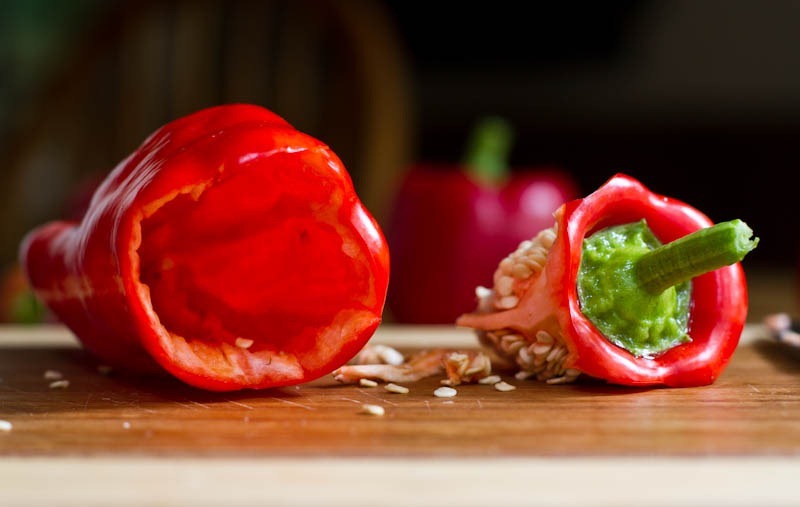 I’ve always been afraid of roasting red peppers, too, for… no reason. I guess the unknown always seems “scary” or, at the very least, intimidating! But red pepper hummus was the first type of hummus I ever tried… so I’ll definitely have to give this a go. I never knew that you had to squash the peppers! I’d be your BEST friend if you showed up with kale… mmmmmmmmmm kale! Looks awesome! I love roasted peppers!! 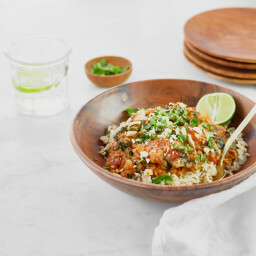 This looks great, and I love that it’s not too heavy on the tahini. i love how u show every step in the pictures. i’ve been married for 4 years and have a 3 year old. we’ve been really unhealthy in our lives. i’m looking for a change and have to admit… i don’t even know the basics, like roasting peppers. i’d love to see more articles on basics…. like a serious how to basics. my husband brought home a zucchini the other day and we just looked at it. i have no idea what to do with veggies. i’m at a loss! <3<3<3 ur very inspiring! Thanks for the suggestion! I actually hope to do many more ‘how-to’ posts! 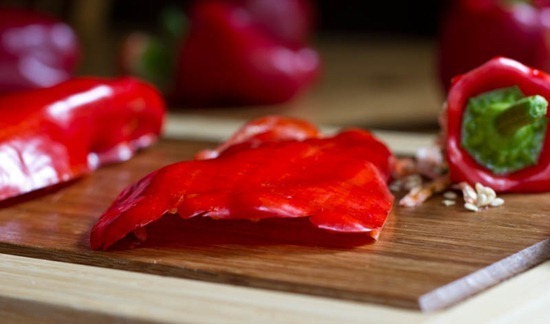 Thank you for the fabulous step by step on how to roast peppers! I have been wanting to roast peppers for the longest time but was so scared I would mess it up! And that hummus looks to dye for! Oh it totally counts as a lunch. 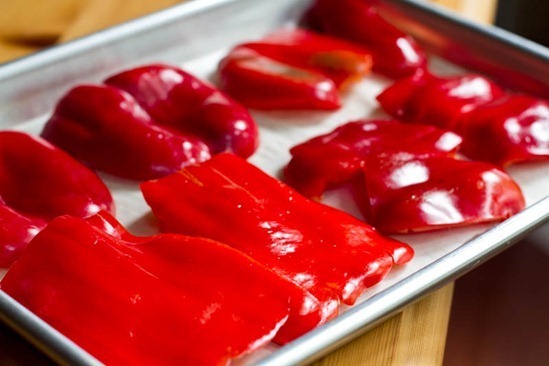 I love the step by step on roasting peppers. Honestly, I’ve never tried it! 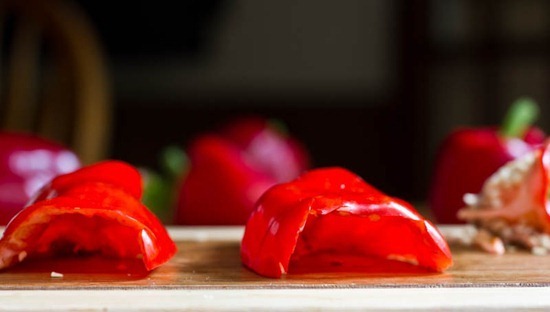 I love roasted peppers but I’ve never made my own — they look pretty simple (and fun) to make! I would LOVE it if someone showed up at my door with a bouquet of kale! Can’t wait to try the recipe – and thanks for the roasting tips! I’ve been scared to roast my own peppers but will definitely try it now. Hummus is the best! This sounds so good. I think I’ll go make it for lunch! Thanks! I love roasted red peppers! I’ve never made them but my mother does it by using the flame on the stove-top! Lunch? I’d eat that for breakfast, lunch and dinner! 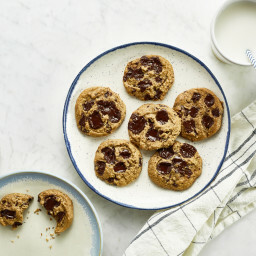 Perhaps a few of your vegan chocolate chip cookies along with the kale would sweeten your neighbours up? Roasted red pepper hummus is my FAV!!! It really does have a smokey flavor and is extra creamy. I think I’m due for a new batch soon ;) Happy Friday! Delicious! I buy roasted red pepper hummus on a regular basis. Hmmm, why buy it when it looks easy to make? Great recipe. Thanks! I love variations on hummus – can’t wait to try this!!! You have the cutest little dishes & bowls – I’ve been thinking about checking out all the local thrift stores to see if I can find some new dishware to update my collection! Thanks Andrea! I think the thrift stores is a great idea. I bought some stuff at the antique market this summer and it was dirt cheap. Love roasted red peppers and this is my fav way to make hummus and doing it all summer. Recently switched it up instead of chickpeas used red lentils and turned out super yummy! Thanks for sharing your way to raost peppers sounds so much easier than the way I have been doing it. Thank you Angela, for your wonderful blog and fabulous recipes! Looks amazing and sounds even better. I have tried roasting peppers before but the skin did not come off so easy. I did not do the wrap and steam method though, so that would likely help ALOT! I will definitely try this soon! Too funny — I just made a batch of roasted red pepper hummus before I sat down to read your blog this morning! I don’t have any red peppers in my garden, though, so I used a jar. Not quite the same effect, I think. Next time I’ll buy some fresh ones and try your roasting method. Looks delicious! Roasted peppers are one of my favorite things everrr. 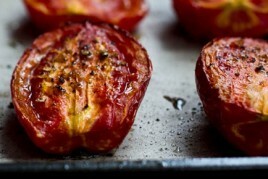 And roasted tomatoes. Roasted red pepper + tomato soup? I think so! Oh and yes…that is definitely considered lunch. Great tutorial! Love it, love it, will make it this weekend. Yummm. Thanks Angela! You make the most beautiful hummus! I love the sprinkling of paprika on top. Hummus for sure counts as lunch…it’s been my breakfast and dinner before, too! Thank you for the tips on roasting peppers this looks delicious! Brilliant, I have a few bell peppers still on the plants that I’m dying to use before they start to rot. Thanks for the inspiration, that hummus looks incredible! This hummus looks SO GOOD! Definitely going to be making it soon. I’ve always been scared to roast my own peppers- that’s why I depend on organic store bought ones :) I’ve been wanting to learn, so this couldn’t come at better timing :) Perfect to whip up this weekend for the long school week ahead! I would LOVE to get a bouquet of kale! I joked to my husband this week that I don’t want flowers for my birthday but would gladly take a bouquet of beautiful curly kale! Mmmmm I’m sure this is delicious! Omgoodness Angela! Last night I roughly followed your recipe from memory for the roasted tomato pesto, and then my own chapatii (or naan), and made a pizza out of it!! it was soooooooooo gooooood~~Even my parents said they loved it! Usually they’re picky when it comes to anything outside of the Korean dishes we eat. I never knew how to roast peppers! I’m totally going to try this! And I LOVE hummus so I need to try this recipe! That looks amazing! And seems so much simpler than I thought it’d be. It looks great! And good work with the photos b/c sometimes it can be challenging (For me at least) to get a bowl of dip to just SHINE and be a superstar…and you totally did! I love roasted red pepper anything!! Thank you for this. Roasted red pepper is one of my favorite hummus flavors so I’ll definitely be recreating this!! Do you reserve 2 tbsp of chickpea liquid or 4? Awesome tutorial! I have always roasted them on the stovetop and seeded them later but this idea seems much easier! Now I just have to grow some patience to wait for them in the oven..
Well as Mr. Rogers once said… “please won’t you be my neighbor :)” haha I would love to have fresh veggies hand delivered to me! All I seem to get are men offering me alarm systems or asking for my vote :(. Great post! I made roasted red pepper soup this summer. At first peeling the skin seemed intimidating, but you’re right it’s not all that bad! I would happy accept a kale bouquet, so much tastier than flowers! I have been hummus obsessed lately so I can’t wait to try this recipe. I also really like the new banner/header. 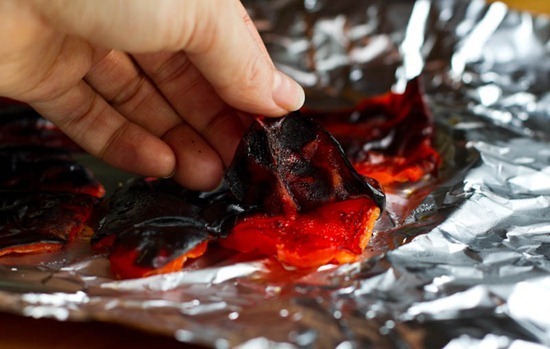 I love your idea of using the foil to wrap the peppers in steam pocket! I usually place them in a bowl and cover in saran.. but it wastes more + more dirty dishes (yuck!) Great Idea!! 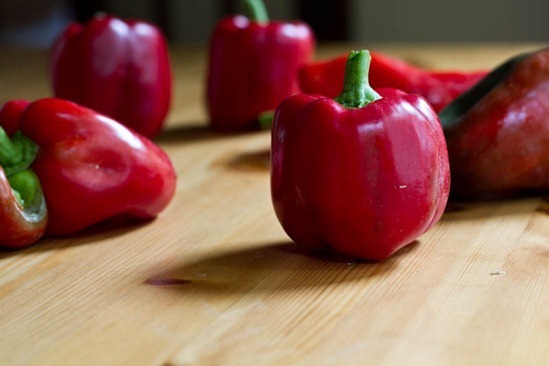 Question, have you ever tried roasting spicy peppers for Mexican type dishes? Just wondering because I usually leave the seeds in the peppers while roasting thinking it would infuse some of the ‘spice’ into the pepper, but I could be wrong. Anyone know? No I haven’t but that’s a good question. Seriously, is there any room in that hummus for my ENTIRE HEAD? That looks amazing and so creamy! I wish I had a bowl of this to have for lunch today. So strange – I literally just made Roasted Red Pepper Hummus 2 days ago – and it was definitely the best hummus I’ve ever made! I have a question for you about how you make your hummus – I’ve only made it with canned chickpeas, and I usually dont cook them first – but the last time I made them I cooked and peeled them and it turned out SO incredibly creamy and delicious. Im not sure if this is because they were cooked or because I peeled them. . Do you ever peel them? And have you ever used dry chickpeas? I’ve heard that the secret to creamy hummus is peeling the skin, so I think that’s probably why! How did you peel it? Well about that . . lol – It took forever! First I soaked them and you kinda pinch them out of their shell, then I decided to boil them good because I thought that would help, though I’m not so sure it did. . but there MUST be an easier way! 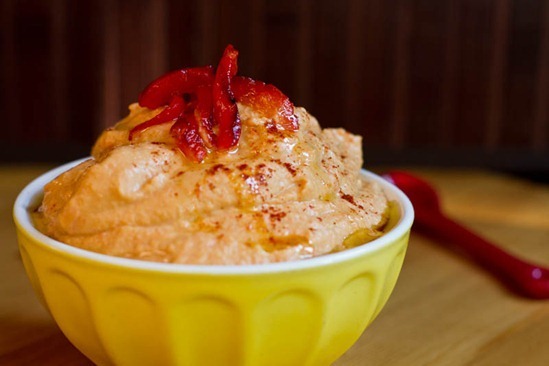 Yum, I’ve always wanted to make my own roasted red pepper hummus! Do you cook your own chickpeas or used canned? Adding this immediately to the rotation. I love experimenting with new hummuses (hummi?) in the store, but I’ve never had the guts to do it when I’m making it myself in the food processor. Plus, now I can figure out how to use the broiler in my super-old-school 20s-era oven. Yum! Do you think this could easily be made as regular hummus (not the biggest fan of roasted red pepper flavour but have wanted a creamy hummus recipe for ages!). Thanks Andrea :). that looks delicious! I keep wanted to make my own hummus – i just need to go for it! I LOVE roasted red pepper hummus. It’s one of my favorites from the store so I make quite a bit of it at home for myself :) Need to make more! P.s. You can bring me bouquets of kale. You should totally bring me bouquets of kale. Pretty please? I’d love to be your kale fairy! I’m having my bridal shower this weekend so I’ll hopefully be getting our food processor and this will be one of the first things I make! 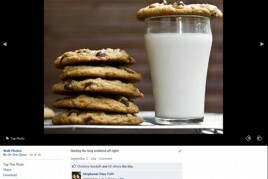 Of course, after I bake those cookies from yesterday! We have a surplus of bell peppers, too, and we’re almost out of hummus. Roasted red pepper hummus was the first kind I ever tried to make, and it turned me into a hummus lover. 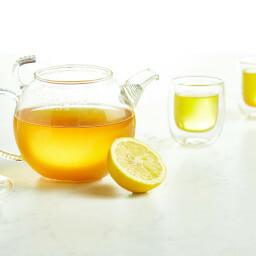 I love that you put lemon juice in your recipe, so I will have to try it out! Oh, that looks delicious. By the way, I would die with happiness if anyone ever brought me their surplus kale! I just made your hummus that changed everything yesterday…..I would dip my foot in it and eat it!! I did add 4 extra cloves of garlic! 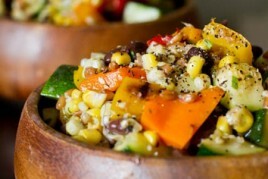 My hubby won’t come near me :) I will have to make this recipe next week!!! And I would take your kale too!!!! YUM!!!! Glad you enjoyed it! LOL @ dip your foot in it…hilarious. Holy Cow!! This hummus with these peppers are killing me over here!! Nothing beats roasted red pepper hummus on a nice cracker or piece of toasted bread! HELLO Friday Night Dinner!! I love roasted red pepper humus! So delicious! My fave variety for sure!! Thanks for the tutorial. Looks so much easier than roasting them whole while sticking your hand in the oven to turn. I can’t wait to try the hummus! You take the most beautiful pictures, and I love the step by step instructions. It makes it seem easy enough that even I could do it! Thanks for the tasty posts! I have recently become Vegan and have found your blog to be heaven sent!!!! Angela, this looks SO good! 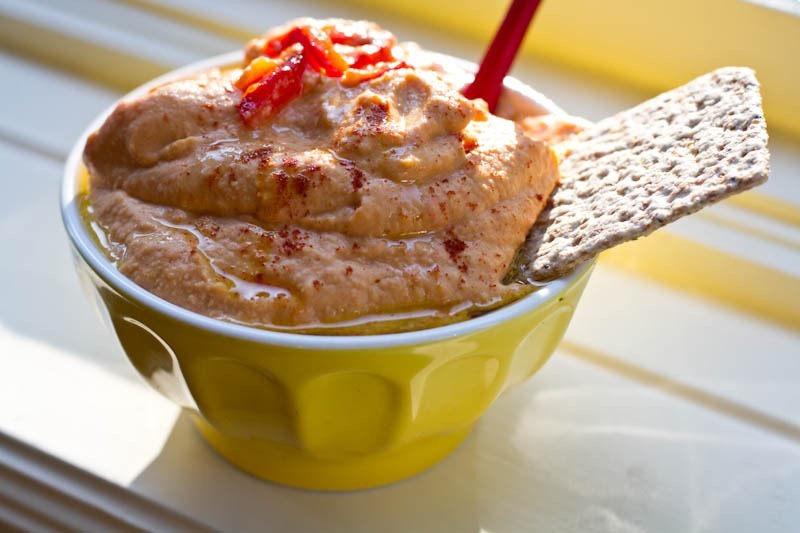 Roasted red pepper hummus is my favorite :) I’m just curious, what kind/size food processor do you use? I’m looking for one to make recipes such as this. Thanks! I have a 14 cup kitchenaid…I got a big one for my bakery :) but it’s not necessary to have one that big. You’re posts crack me up. So cute yet very informative. Love red peppers…Love hummus…Love fresh peppers from the garden…Love chickpeas. Love your pics. Woot! I love roasted bell pepper hummus! Ok and all other versions. But I have made another version of the roasted bell pepper hummus and am curious to try this one. This was wonderful Angela! I used navy beans instead of garbanzos because that is all I had, an boy oh boy was it delicious. Definitely the creamiest hummus ever! I want you to know that I have been cyber stalking your blog for a week or so and I am so inspired by your stories (leaving a job I hate is something I can completely relate to, as I am sure many of your other readers can). My husband and I are expecting in December and I decided this week that we needed to start working on getting rid of our unhealthy eating habits before the baby got here (or old enough to eat the junk we’ve been giving ourselves). I made my very first Green Monster this morning and I loved it. Besides that, the baby was literally leaping around inside like it was the best thing that ever happened to him. The Green Monster definitely gets baby Noah’s stamp of approval. Hey Kasey! That is great to hear :) Congrats on your pregnancy! I love hummus and I haven’t made it in years! Great reminder. 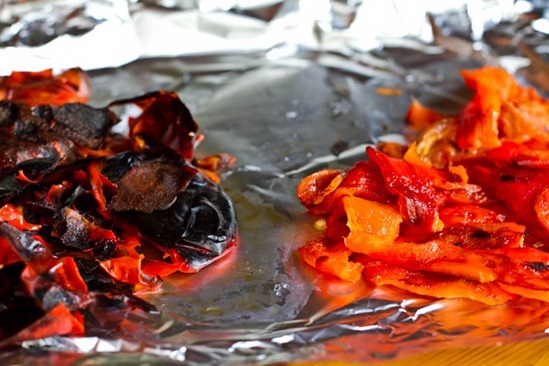 Wow, I had no idea the roasted peppers were so easy to prepare! I love the picture of you squashing them down. I actually burst out laughing! Hi, Angela. This looks great. I’m going to be making some hummus this week, as well as your tomato basil pesto. I was wondering what your thoughts are about freezing hummus. If I make it, I tend to make a lot, and I don’t want it to go to waste. The same goes for pesto, although I’ve heard of people freezing the pesto in ice trays. What do you think (regarding the hummus)? Also, I made your spicy rainbow bean salad last night, and enjoyed my first (and AMAZING) bowl of overnight oats this morning. thanks for sharing your wonderful craft, and I look forward to making as many dishes as possible with the great recipes you’ve provided! Cheers. Hey Olivia, So happy you are enjoying the recipes! I’m not sure if you can freeze hummus! Pesto yes (and ice cube trays is a great idea!). I would try googling it to see if someone else has already figured that out. Thought I’d let you know that the amazing blogger from “karla’s closet” mentioned your blog in her August 29th post! Do you “shell” your chickpeas? Like pop them out of their little skins or leave them as is? Hummus is addicting…especially roasted rep pepper!! This is the first red pepper hummus recipe I’ve ever tried – it was as smooth and creamy as store-bought but was even tastier. I used red peppers from the garden so had the added satisfaction factor blended right in! This is getting filed in my favorites and will be used again and again! Glad you enjoyed it Jane! I always thought people were crazy when they claimed to “crave” something like hummus and vegetables after a workout. Until I ate your roasted red pepper hummus, and fantasized about it during my run yesterday. LOL. Needless to say, I hate a big heaping scoop of it with a cucumber and carrots when I got home. Hit the spot! OMG!! I just made the hummus this morning….I’ll say it again…OMG, it was the most creamy, smooth, delicious hummus EVER. Bless the roasted peppers!! Many thanks Angela! We thinned out the leftover with a little more olive oil and used it as a salad dressing–also delicious! Hi Angela! I am a long-time lurker that had to pop in to say thanks for all the hard work you do for your readers! I am a pretty “by-the-book” cook, and rarely experiment with recipes. And sometimes it’s hard to visualize what a recipe wants, but the fact that you take step-by-step pictures is incredibly helpful! Thanks to you, I feel more ready and willing to tackle things I normally wouldn’t (not to mention the inspiration you’ve been while I struggle with my weight and depression). Thank you. Re: roasting, there is an easy peasy way of doing it: stove! It doesn’t matter if it is gas or electric stove. I roast anything on fire by simply placing 1-2 eggplants or red/green peppers on the stove and turn them around until their skin turn into black all around. Then place them inside of a closed lid, anything you name: plastic/glass jar or tupperware. I sometimes use plastic bag and tie it around tights. Leave them inside for a good 5-10 min. Then I quickly take them out and cool them down under running water for 5 sec. Sometimes I skip this last step if they are not super hot. You peel them and yayy it is ready! OH MY. This is AMAZING!! It actually reminds me of this dip that is sold at Loblaws and Zhers, Roasted Red Pepper with Feta Dip. It was my favourite, high in calories and had dairy….but I loved it. So I am even more excited that this is so similar without the high calories and dairy. Way to go! And as if this hummus weren’t good enough on it’s own, it also makes a wonderful pizza cheese substitute! I just made the recipe as directed, except i doubled the garlic! ( were garlic freaks!) I also substituted the tahini for a tbsp or so of seasame oil….more potent, so you use less, and I use seasame oil more than I would ever use tahini. Tastes FABULOUS!!!! thanks so much!!! This is my hummus that changed everything! Thank. You. I just made this tonight to go with some quinoa cakes and it was delicious. Mmmm. I tried this tonight! It is yummy but I must say the bitterness of the tahini is overwhelming. I would really like to know if the kind of tahini in a can that I buy is different than the one I see in recipe. Because I NEVER like the hummus I make! And I have tried and tried. Any tips for less bitterness? Delectable!! My husband is not very fond of hummus, BUT he loved this one! Thanks! Just made this and I absolutely love it. Wow, the squashing of the peppers. Damn, if only I had read this before I didn’t squash the ones I roasted yesterday… hehe. Great tip! I wondered if I could use a red & yellow pepper in this recipe? Wanted to make this but I don’t think I have enough red? I used mini sweet peppers of different colors. The recipe was very very lemony so dropped to 5 teaspoons lemon and it was perfect. Maybe the 5 tablespoons in a typo?